LEAF: excellent fall color that ranges from brilliant yellow to deep red. Mine is always yellow. Although native to Iran, Persian ironwood (Parrotia persica) is beautiful, small growing tree that will flourish from Texas to Boston and all parts in between. 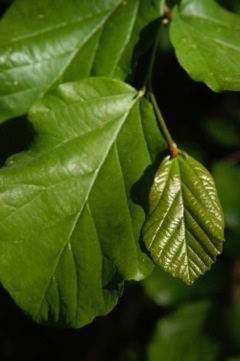 It a great little tree with exfoliating bark similar to lacebark elm (Ulmus parvifolia) sycamores and plane trees. 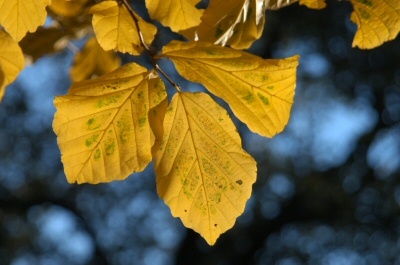 The luxuriant summer leaves similar to beech (Fagus species) and witch hazel. In winter the smooth bark peels and shows a mosaic of silver, green, and cream-colored new bark beneath. Small, petal-less flowers emerge in late winter and early spring, before new leaves emerge. These inconspicuous flowers are bunches of blood red stamens borne inside two woolly brown bracts, giving the naked branchlets a crimson haze. They can be used in indoor arrangements. After flowering, new leaves emerge, coppery at first, becoming dark green, satiny, and lopsided with wavy edges. In the autumn the tree displays fall color that ranges from golden yellow to crimson, rose pink, maroon, and purple, all of which can sometimes be seen at once on a single tree. 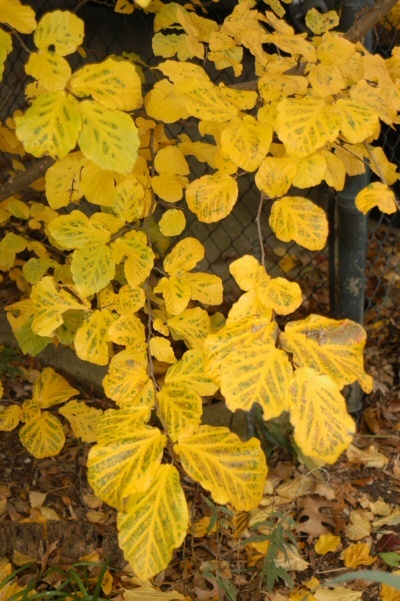 It is a member of the witch hazel family (Hamamelidaceae), which includes the witch hazels (Hamamelis species), the winter hazels (Corylopsis species), Fothergilla species, and Chinese witch hazels (Loropetalum species). 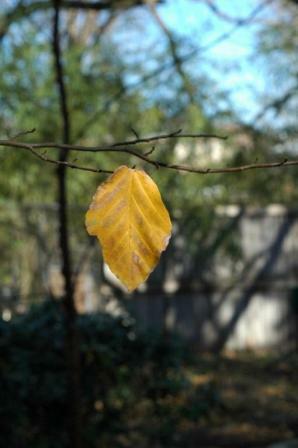 Only two species comprise the genus Parrotia, the other being P. subaequalis from China—a rare, small tree or large shrub. 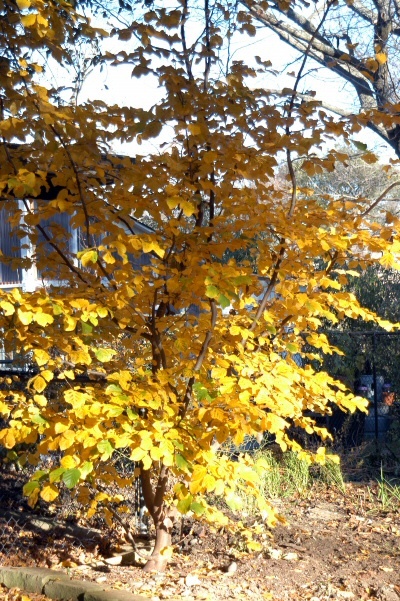 Parrotia is often confused with the true witch hazel. Persian ironwood grows relatively slowly into a low-branched, round-headed tree. It can be trained into a standard, single-trunk specimen. In cultivation, this tree can reach 40’ in height forming a short, thick trunk supporting both erect and drooping branches. It has dense wood often used for telephone poles, bridge construction, and tool handles in Azerbaijan. 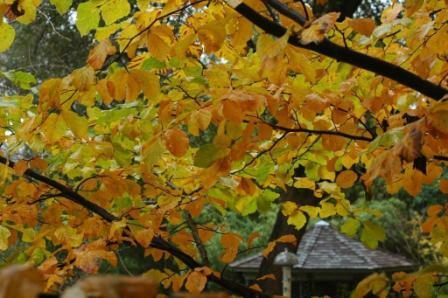 Persian ironwood grows well in a variety of environments across the country and des well in partial shade, but will produce the best fall color in full sun and well-drained rich soil. I recommend it highly. NOTE: Yes I did have this plant mis-identified in a couple of publications. I could blame the nursery that sold it to me as witch hazel, but it was my fault. Persian ironwood (Parrotia persica) is a deciduous tree in the family Hamamelidaceae, closely related to the witch-hazel genus Hamamelis. It is native to Iran and the Alborz mountains. Witch hazel (Hamamelis virginiana) grows wild in East and Central Texas as well as the entire eastern half of the US, usually near creeks and streams as an understory plant. It adapts to various soils and does well in landscape situations or in the herb garden.